What is Tata Harper Rejuvenating Serum? When to use it? What’s inside the serum anyway? What’s to keep in mind about the use? What rules about the serum? What doesn’t? What we like the most about the serum? The diversity of the cosmetic products is more than impressive and choosing just one for your skin care routine may found you in a pickle, especially since skin reacts differently and you can never be too sure it’s going to work for you too. Sure, you can always go on line, ask around and gather all the information you need for making a decision. However, if you decide to go with a natural option, chances are you’re not going to be too much from the perfect choice. You should put your money at stake with a serum that is loaded with natural ingredients that are already known for their benefits on skin. 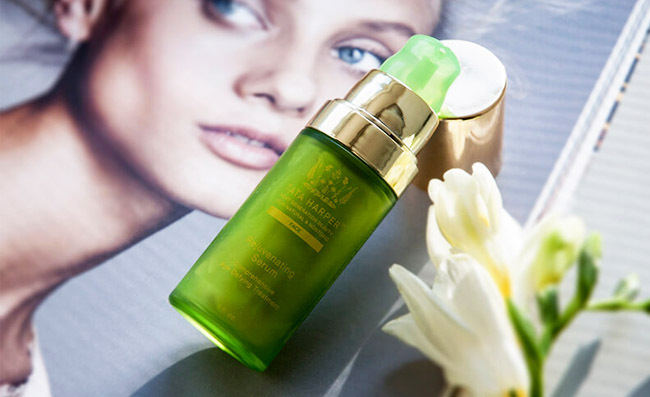 Tata Harper Rejuvenating Serum does stand out with the strong combination of ingredients that reduce the visibility of aging, leaving your skin firmer and healthier looking. The effective combo diminishes the appearance of fine lines and wrinkles, while temporarily relaxing the looks of wrinkles. Your skin is moisturized and more radiant, gaining its youthful vibe back. The formula is an award-winning one and combines hyaluronic acid, vitamins and antioxidants that make your skin firmer and healthier. The list of ingredients is long enough, so going over all of them is a bit challenging. However, we decided to only pinpoint the most common ingredients for a better understanding of the serum’s efficiency. Aloe barbadensis leaf juice- slows down the aging of skin and is a great ingredient when treating eczema and psoriasis. It moisturizes the skin and keeps acne at bay. It reduces the visibility of stretch marks and sooths in sunburns. Mango seed butter-is loaded with vitamin C so it makes the skin tighter and firmer. It contains vitamin A so helps your skin look more radiant and rejuvenated. It diminishes the fine lines and wrinkles. It sooths the dry patches, eliminating flakiness of skin. It’s a great ingredient for the dry skin and moisturizes deeply. It protects the skin from the environmental aggressors and calms the skin. It alleviates itching skin too. Olive oil-it sustains the cellular regeneration. It slows down the aging of skin and removes the dead skin cells from the skin. It makes the skin smoother and firmer, leaving it well hydrated and nourished. Safflower-prevents dryness and roughness of skin, cleansing it from dirt and oil. It’s a reliable ingredient for treating acne, psoriasis and eczema too. It hydrates the skin and improves its elasticity, minimizing the visibility of wrinkles. Rice extract-is a good ingredient for the sensitive and allergy-prone skin. It helps the skin bind moisture and improves its elasticity. It hydrates the skin and reduces risk for skin irritation. Gotu kola extract-fights against the aging of skin. It reduces inflammation and boost elasticity of skin. It helps with the healing of skin and addresses all skin types. Willow bark extract- works against inflammation of skin, addressing eczema, rosacea, psoriasis and various fungal infection. It heals the skin and reduces irritation. Calendula flower extract-it’s anti-inflammatory and anti-septic. It helps with healing in sunburns, rashes or various wounds. It comforts the skin in contact dermatitis and makes the skin suppler. It calms the dry skin. Daffodil bulb extract-it sooths the irritated and itchy skin. Spanish lavender extract-it reduces inflammation and controls the oil production in skin. It calms the irritated skin and heals burns and other skin issues. It minimizes risk for scarring and discolorations and treats acne too. It doesn’t dry the skin and keeps breakouts at distance. The serum has a creamy consistency, but it’s easily absorbed into the skin. It smells amazing and feels so good on the skin. You can use it on your cleansed face, even twice a day. Some even eliminated foundation when using the serum. There’s nothing synthetic about the serum so it works for all skin types, sensitive skin including. Our favorite part about the serum is its natural formula and its high efficiency when it comes to keeping the skin healthier, younger and firmer. That’s quite a lot for a serum, right? Recent reviews on Sugar & Fluff Beauty: the Ogee Seeds of Youth Serum, the Murad Invisiblur Perfecting SPF 30 Serum, the Tata Harper Resurfacing Mask, the Ogee Jojoba Restore Face Oil, the CLEARstem Acne Scar Removal Serum Review.